Silver charms make a beautiful addition to a variety of jewelry items; with a simple loop or hanging ring, they can hang from a charm bracelet, a necklace, or earrings. With precious metal clay and the right tools, you can make your own charms for sale or personal use. The process enables an endless range of shapes, sizes, and designs. Choose a hard surface; a work table or craft table works well. Clean the surface carefully, and allow it to dry. Use silver precious metal clay in lump form. Moisten your hands with a few drops of olive oil or almond oil. Break off a small piece of the clay, and use a rolling pin to roll it into a sheet. Make sure that the sheet is uniformly thick. Use a toothpick to outline the shape of your charm on the surface of the clay. If you are unhappy with the shape, make the clay back into a ball and roll it out again. Poke a small hole through the top of the charm or add a small loop at the top for hanging. Use a razor knife to cut the shape out of the clay sheet. Pull up the sheet around the charm, and set it aside. You can add custom texture to your charm using your razor knife or a small carving knife. While the clay is still soft, add textures using household items. Press a button into the clay to create relief, or push the charm into a rough surface. You can use any number of objects, from zippers to sand paper, to add texture. Once you are happy with your charm, gently slide a spatula under it to release it from the table. Set it on a mesh screen and leave it to dry out, or first create a hanging ring. Choose the bracelet or piece of jewelry you plan to use with the charm. Find the spot the charm is going to hang from, and use it to determine the circumference and thickness for a hanging ring if you didn't create a loop. Use a rolling pin to roll out a thin bar of clay to the correct thickness. Cut it to a length that is slightly longer than the circumference desired. Roll the bar into a circle, and slip the ends through the hole in your charm. Use a small amount of water to join the ends. Set the piece on your mesh screen until it dries. The screen allows maximum airflow. Heat a small kiln to the temperature recommended by the clay manufacturer. Slide your charm with hanging ring into the kiln, and leave it there for the amount of time that is recommended by the manufacturer. Remove the charm, and allow it to cool completely. Polish the charm with a burnishing tool or polishing paper. 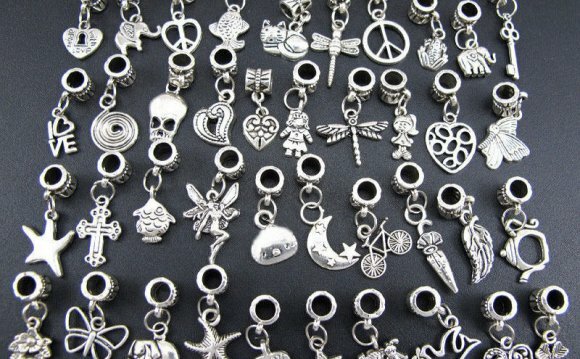 When you are making silver charms, high-quality materials produce the best results. On eBay, you can find all of the supplies and tools you need, from precious metal clay to small kilns. Finding the right item is easy; type the name of the tool into the search bar that appears at the top of the page, and click the Search button. Examine each listing and photograph carefully to ensure you order the correct item and quantity. How to use Precious Metal Clay?